The Rebel Sweetheart. : Toys for the Big Boys. Three Christmases ago, my son received his very first drivable toy car from his grandmother (my Mum) - a yellow All-Terrain Vehicle. Mum knows I'm a huge fan of Stone Cold Steve Austin (my son's second name was actually taken after him), so she made sure that her grandson's ATV is a close resemblance of Austin's vintage quad. The little man loved his ATV a lot, and he still plays with it to this very day. I have a feeling, though, that it won't be long when he'd ask for his own 'big ATV'. Lately he's been telling me that his legs feel crammed while driving, and his weight might be too much for his ATV to carry - as if hinting that it's time to get a new and bigger one. One of these days he might just tell me outright to buy him the real deal - a Yamaha Rhino, complete with Yamaha Rhino accessories. If that time comes, I won't be too surprised. And then I would just tell him to go ask Grandma, because Grandma has a better eye for detail, knows a lot more about ATVs than I do. But best of all, because Grandma hardly ever says no. Owning an ATV is so cool. I was able to try it in Bohol going around the Chocolate hills and in Boracay going into Mt. Luho and its very dependable on rough terrains. 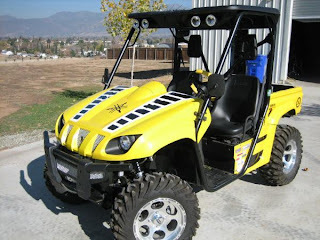 ang cool magka ATV!! :D delikado lang to play around with it pag nasa city ka :P lol! I'd like to have an ATV for myself :). Will try that when my daughter and I go to Bohol. That is one impressive toy, I must say! I would like a lawn mower in that style. Yep I was going to say, "Go ask Grandma." So which one is in the photo? It doesn't look small at all. go ask Grandma --Best line EVER!! !